Eat This, Not That! For Kids! By David Zincezenko with Matt Goulding / Rodale Press | Breezy Mama Breezy Mama - Expert parenting advice, celebrity interviews, product reviews for kids, moms and babies and more! Eat This, Not That! has to be one of the greatest, most interesting books that you can read for your kids. 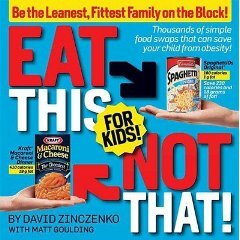 Filled with facts about what to and what not to give your children to eat, your mind will be blown away by the foods that are bad. Think those apple chips are better than goldfish crackers? Think again! Goldfish only have five grams of fat per serving where the apple chips have seven. What about Taco Bell? You would normally give the kid a soft taco over a crunchy taco, right? Nope—Fresco Crunchy Beef over Ranchero Chicken are the way to go. Broken up into sections covering eating out, snack food, prepared food and food you cook, this book is indispensible. It even suggests fun family activities that help you lose weight. I keep mine on the coffee table and when someone picks it up, mom or not, they are hooked for at least the next half hour. Click here to pick up yours. Breezy Tip: Want to see if your child’s favorite snacks are good for him? Go to Snackwise.org—by filling in the nutritional content of the food item, the site tells you if the snack is good, bad or decent.